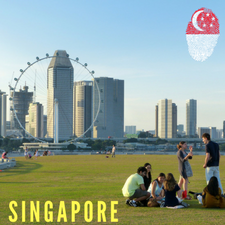 Singapore, one of the most popular destination among Asian countries for those students who dream of receiving a high-quality education at an affordable rate, has a different visa procedure to be followed. While getting a visa is relatively easy (when compared to the United States), if you are not prepared with all the necessary documents, you will get a rejection. While the larger Indian crowd, lesser distance from the homeland and excellent facilities with top-notch University makes it an ideal destination for higher studies, get yourself acquainted with the visa process to ensure a smooth and trouble-free visa experience. Singapore has many well-reputed Universities with the National University of Singapore (NUS) and Nanyang Technological University (NTU) ranked among the top thanks to their offering of a variety of high-quality courses, taught by the best in the field. Tuition costs are very reasonable. Cost of living is quite low. Singapore is one of the safest cities in the world. Once admission is obtained, the next step is to obtain a Student Pass or Visa to study in Singapore. The Student Visa is usually issued for the entire duration of study at the cost of 30-50 Singapore dollars. The Student Visa takes only about 10-15 working days to be processed and issued, but earlier applications are encouraged. A letter from the University confirming the students admit is necessary to be eligible to apply for the Student Pass. The application to obtain a Student Pass can be completed online at the Student Pass Online Application and Registration System (SOLAR). The applications are submitted to the Singapore Embassy in your country of Residence. Letter of admission from the University. Three Completed application forms and visa fee receipt. The visa fees can be paid only through Cheque or Demand Draft. Passport and a minimum of two recent passport size photographs. Proof of sufficient funds for the entire duration of the study. This includes bank statements, fixed deposits proofs, student or educational loans, etc. Academic Transcripts, Degree certificates, GRE and TOEFL/IELTS score reports. Statement of Purpose, Resume and three recommendation letters. Vaccination certificates as per the requirements of the University and the Country. Health and travel insurance (optional). Minimum of 2 photocopies of all the above documents. The Immigration and Checkpoint Authority (ICA) decides the status of the received applications. The visa processing will take a minimum of 15 days to a maximum of 4 weeks so sufficient time must be allowed for its processing and issue. an interview for issuing the visa is not part of the process, but if required it will be made known. Answer the questions confidently and to the point. The processed visa can be collected directly from the Embassy or through courier service. The visa application must be submitted to ICA two months before the start of the course. Incomplete applications will not be processed so care must be taken to submit all the required documents. In the case of online applications the progress can be followed online using the unique Transaction Reference Number. Student Visa recipients will not be allowed to work. The Singapore government has a strict rule that only students engaged in courses that have a duration of greater than two years are eligible to apply for work. Studying in Singapore is an opportunity for aspiring students. Acquiring the Singapore's Student Visa can be made stress-free by carefully making ready all the required documents and following the visa procedures accurately.